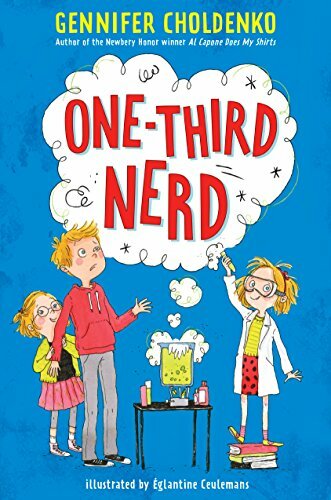 Liam knows that fifth grade is not for beginners and being more than one-third nerd is not cool. Liam and his family live in the Bay area in San Franciso with his mom and two sisters. Dakota has a big personality and loves science but, has a hard time making friends. Izzy has Down syndrome, loves giving hugs and can make friends easily. Their dad works in insurance and lives across town but, stops by with food often. And Cupcake is their lovable German shepherd that guards their apartment. Lately, Cupcake has a problem. She has been peeing all over the apartment. The family wants to take her to the vet before their landlord can find out. Their parents have said if Cupcake doesn't stop, they will have to find her a new home. However, the kids can't give their beloved pet away. Will they be able to save Cupcake in time? The novel was a fun and quick read. I like how each of the characters had their own well developed and distinct personality. Liam being the caring, protective older brother, Izzy being the intuitive friendly sister and Dakota was caring but a bit brash. I am disheartened to say, that I found Dakota to be a bit too much and I felt her character was a bit over the top, even if she meant well. Overall, it was a fun read.